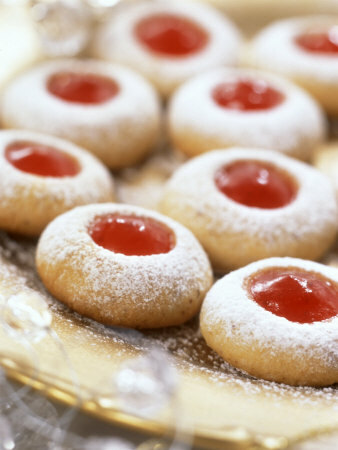 This has to be one of the easiest Christmas cookie recipes ever! They are delicious though, which makes it that much better that they are so easy to make. Cream the butter and cream cheese; slowly add the sugar, beating until fluffy. Beat in the egg yolk. Add the flour and vanilla, mixing well with a large spoon. Chill the dough for at least 1 hour in the refrigerator. Preheat the oven to 325F. Shape the dough into 1″ balls with your hands, and place on a lightly greased cookie sheet. Gently press a candied cherry half (red or green, or mix them up) or a toasted pecan half into the top of each cookie. Bake for 12-15 minutes. Cookie won’t take on much color on top, but will be golden brown on the bottom. Transfer to a cooling rack to cool completely. If desired, sprinkle cookies with powdered sugar. This entry was posted in Holiday Cookies and tagged candied cherries, christmas cookies, cream cheese, pecans by quarlj01. Bookmark the permalink.